Remember Marlon McCree? Probably not, but Troy Brown certainly does. How about Billy Cundiff? Patriots fans do, even if Ravens fans would rather forget. And Andy Reid reminded us last week that his poor clock management skills never cease to amaze – and help the Pats in the postseason. On Sunday, there was a twist ending. Stephen Gostkowski, the kicker who has seamlessly replaced the legendary Adam Vinatieri for a decade now, was one of the biggest goats for missing his first extra point since 2006. Despite Tom Brady and Rob Gronkowski’s fourth-quarter heroics, it was the Broncos’ defense that had the Mile High Magic. Brady fell to 2-7 lifetime in Denver, including 0-3 in the postseason. This “karmic” twist of fate is more than refreshing. In the end, there was no miracle finish for the Patriots. There almost was, but almost isn’t good enough. Just ask those aforementioned Chargers, Ravens, Eagles, or Chiefs teams (just to name a few). Gostkowski, one of the game’s premier kickers, will wear this one for the duration of the calendar year. A rule buried deep in the rulebook reared its ugly head for the first time at the most inopportune moment for the Raiders. 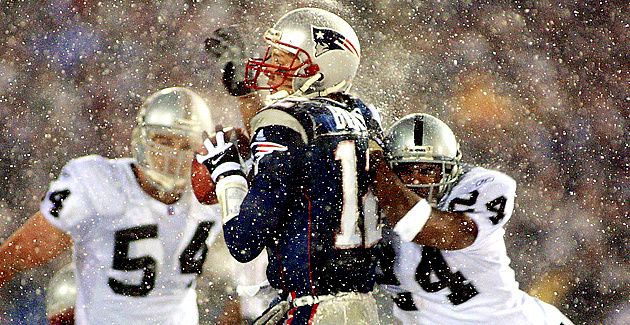 Brady’s former Michigan teammate, Charles Woodson, appeared to seal the win for Oakland with a strip sack, but after a lengthy review, the call was overturned. Adam Vinatieri followed with one of the most difficult field goals in NFL history, a 45-yard line-drive through the howling snow to send the game to overtime. From there, a Patriots win almost felt like a formality, and New England went on to upset the heavily-favored St. Louis Rams in Super Bowl XXXVI. Though the Raiders did reach the Super Bowl the following season, they have not made the playoffs since the 2002 season. This may well be the most rotten moment in a heartbroken franchise’s history. The Chargers were 14-2 that season, winning their final 10 games and, for all intents and purposes, outplaying the Pats for most of that sunny Sunday afternoon. And then came the implosion. The Patriots, trailing 21-13, were facing a 4th-and-5 at San Diego’s 41 with 6:25 to play. Brady was picked by the safety McCree, but rather than just going down, he tried for a return, and was promptly stripped by Brown, the Patriots’ jack-of-all-trades receiver. Ex-Charger Reche Caldwell recovered, and naturally, the Patriots utilized this fresh set of downs to drive for the tying score before salting it away late with a Gostkowski field goal. Once the game became official on yet another Nate Kaeding missed field goal in January, LaDainian Tomlinson took exception to the Patriots celebrating atop the midfield logo, an ugly sight to what will go down as perhaps San Diego’s most painful loss ever. The game also turned out to be the last one that Marty Schottenheimer ever coached (he finished his career just 5-13 in the playoffs). Apparently, Schottenheimer was also a prophet. NFL Films had him miked up before that game, and he was heard telling McCree that he would in fact come up with a critical interception but advised him to hold on to the ball. 2011 AFC Championship Game – Oh, Billy! This one won’t stop hurting for Ravens fans (trust me, I know). To be fair, Cundiff wasn’t the lone culprit for Baltimore’s 23-20 loss, either. Wide receiver Lee Evans also earned himself a one-way ticket out of town for his role in the meltdown. With the Ravens trailing by three in the final minutes, Joe Flacco led his team down the field, often picking on receiver Julian Edelman, who was playing cornerback for the depleted Pats secondary. But after a 9-yard gain to Anquan Boldin set up a 2nd-and-1 (and, in true Patriots fashion, some confusion over the stadium game clock), Flacco threw a perfectly-placed back-shoulder throw to Evans. Rather than secure the catch, Evans was nonchalant through the play and was stripped by Sterling Moore, denying Baltimore what would have been the winning touchdown. Super Bowl XLIX – Just give the ball to Lynch! Very few people knew who Malcolm Butler was before this moment, but New England has a way of turning pedestrian players into household names because of moments like this. Give the Seattle Seahawks’ coaching staff an assist, as well. Trailing by four with a half-minute to play, the Seahawks were set up as perfectly as you could script to win their second straight Lombardi trophy. On 2nd-and-goal from the 1-yard line, you figured Marshawn Lynch would get the ball at least twice, if not three striaght times. Instead, as most coaches often get suckered into doing, Pete Carroll tried to outsmart Belichick, but ended up outsmarting himself. 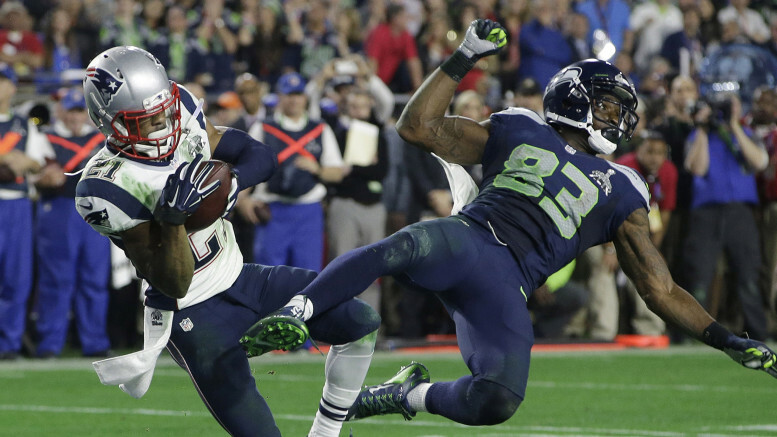 Russell Wilson tried to force a pass at the goal line to Ricardo Lockette, but Butler jumped the route, and sealed the most dramatic Super Bowl win in recent memory. Instead of celebrating a great play or an epic win, more fans were left wondering just what the heck the Seahawks were thinking on that final play call. Be the first to comment on "In a rare twist, the New England Patriots don’t get the big breaks in a big playoff moment"